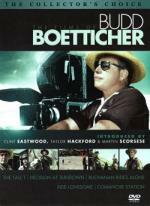 Budd Boetticher… the name probably doesn’t ring a bell… that is, unless your favorite film genre is Westerns. He was to sagebrush cinema, what Val Lewton was to horror films, a master at making cheap, but entertaining B-movies which brimmed with quality. Not unlike a shooting star, his tenure in Hollywood was brief, but brilliant. And though he started making movies in the mid-forties, it was his seven films with Randolph Scott from the fifties for which he is fondly remembered. Five of the films are gathered together in what has become known as one of the best DVD releases of 2008, The Films of Budd Boetticher, a must have for serious Western aficionado’s. The first film in the set is the second pairing by Boetticher and Scott, a deep, rich character study called The Tall T. Scott stars as Pat Brennan, a cowhand who loses his horse in a bet and hitches a ride with a wealthy couple on a passing stagecoach. At the next way station, the group is captured by three outlaws, who decide to hold the wife for ransom. It turns out that the wife was a spinster, who had recently married a cowardly acquaintance of her father’s, who only courted her to obtain the easy life her money would bring. But now, as death stares at him cold in the face, he bargains with the outlaws to help them obtain the ransom. The leader of the gang, Usher (Richard Boone), has utter contempt for such a sniveling coward and agrees to send him for the money, but at a price. He knows that the man will not return, and will run as fast as he can, as far away as he can, so he sends one of his gang out to kill him. This leaves Brennan to find a way out of the dilemma that he and the wife are now in. But slowly, through guile and deception, he eliminates the two younger outlaws, setting the stage for the showdown with the older, but craftier Usher. Now, from reading this brief synopsis, it seems pretty much the standard for a western of the time. But in the hands of Boetticher, the screenplay which is based on a short story by Elmore Leonard, moves fluidly from premise and character setup, to tension building climax, all the while, showcasing cinematography that would become a trademark of all successive Boetticher films. A very good start to a wonderful set of films. The next film in the set deviates slightly from the normal setting of a Boetticher/Scott film. Whereas most of the films take place out on the open range, Decision at Sundown is set in a small, yet bustling western town. This time, Scott’s character is a man not only seeking revenge, but his self-respect. He has come to the town of Sundown to even an old score against Tate Kimbrough (John Carroll), the man he believes killed his wife three years earlier. It is the only time in their collaboration where Scott’s character is not seen as hero, but as vengeful villain by the confused townsfolk, who rally behind Kimbrough against this stranger set on vengeance. When the true nature of Scott’s wife’s demise becomes apparent, his ‘decision’ will redeem him before the town’s populace and the audience alike. Jonas Ward...Novel "The Name's Buchanan"
Once again the setting is a small town, but this time the town is run by a group of corrupt brothers who turn on each other in the name of greed. Agrytown is on the border with Mexico, and from the moment that Tom Buchanan (Scott) rides in, he knows that he must keep his wits about him. Unfortunately, he helps the son of a powerful Mexican landowner who has killed the son of the town judge, Simon Agry. With the sheriff being Lew Agry, the deck is decidedly stacked against both Buchanan and the Mexican. At his trial, Buchanan is surprisingly acquitted by the judge, but all of his money is taken and he is ‘escorted’ out of town. The sheriff, who is at odds with his brother the judge, decides to have one of his deputies’ kill him outside of town limits, but Buchanan escapes. He makes his way to the young man’s family estate in Mexico to procure a ransom that will free the aristocrat’s boy, who is scheduled to be hung. The ransom now becomes the prime prize in a tug of war between the two feuding, back-stabbing brothers and leads to a very unique showdown. In the end, the brothers get what they deserved; Buchanan gets his money back and he rides off alone. I have to say that while the ending was a complete departure from the atypical shootouts of the time, the rest of the film just didn’t click for me. I guess it was Boetticher’s attempt at adding a little comedy to the proceedings, but it just doesn’t work. The main cast, aside from Scott, seems completely out of place in their surroundings, with the exception of Barry Kelley, who plays the sheriff. But in a set of five B-films, you can’t expect all to be treasures. The last two films in this wonderful set are where the cream rises to the top. Ride Lonesome and Comanche Station are brilliant examples of movie making which melds the great aspects of a film together; Screenplay, acting, cinematography and direction. Set in the wilds of Arizona, Ride Lonesome starts out as a revenge yarn, which evolves into a chase film and finishes in a climactic showdown that brings about redemption for the main character. Ben Brigade (Scott) is a bounty hunter who has just captured Billy John (James Best), a wanted murderer with a hefty reward on his head. His plans are to take him to Santa Cruz where the outlaw will be hanged. But Brigade must get there before Billy John’s brother Frank (Lee Van Cleef) and his gang can set him free. When they stop at a staging post, they and a couple of lesser outlaws are attacked by Apaches. They ward off the attack, but when they realize that the station manager was killed by the Indians, they decide to take the manager’s wife with them to safety in Santa Cruz. Brigade enlists the help of the two outlaws who are seeking a way to procure amnesty for their crimes. Brigade realizes that they want Billy John for themselves to help them get their pardons, but understands that he can’t make it to Santa Cruz without their help. What follows is a suspense packed chase through Apache territory, with the group staying just one jump ahead of both the marauding Indians and the vengeful gang. The last in a great collection of films takes place again in Indian territory, but this time with the Comanches. In this final foray, Scott plays Jefferson Cody, a man who has been searching for his wife, who was kidnapped by Indians years earlier. When he learns that the Comanches are holding a white woman, he sets off to barter for her, thinking it’s his wife. When he arrives he finds out that it is not his wife, but a beautiful young woman named Nancy Lowe. He trades for her release and sets out to bring her back to her husband, wondering if her husband will take her back after having been taken by savages. On their way back, they stop to water their horses at Comanche Station, a way station out on the frontier. Suddenly they see three men on horseback being chased by Comanche warriors. Cody recognizes one of the men as Ben Lane (Claude Akins), a soldier he helped drum out of the service years earlier for suspected Indian atrocities. He now suspects that Lane is being hounded by the warriors for the very same thing. They fight off the attack and after the dust settles, Lane informs Cody of the reward being offered for the return of Mrs. Lowe. This sets the stage for a tension packed journey back to the Lowe’s homestead with Cody needing the help of his old nemesis to bring the woman home. All the while knowing that at first chance, Lane will kill him, not only to get the reward, but to settle the old score from the Army days. I have this set though I have not yet seen all the films in it. I have also bought separately the two films Boetticher and Scott made together that are not in this set, Seven Men From Now (which I really like) and Westbound. The one thing that bugged me about this set is that, since Randolph Scott is the lead in all 5 of the films in this set, I feel his name should have been in the title as well. We've had The John Ford-John Wayne Collection so why not The Budd Boetticher-Randolph Scott Collection? I have this set though I have not yet seen all the films in it. Which films have you seen? The one thing that bugged me about this set is that, since Randolph Scott is the lead in all 5 of the films in this set, I feel his name should have been in the title as well. We've had The John Ford-John Wayne Collection so why not The Budd Boetticher-Randolph Scott Collection? I agree. I also think it would have helped the sale of this set. More people know Scott than Boetticher. Okay, I have to confess. I haven't seen any of the films in that set yet But I have seen Seven Men From Now. That one includes Gail Russell as leading lady and everyone's favorite bad guy (well, one of my favorites anyway)...Lee Marvin. I'll make an effort to start watching the films in the box set soon. Cinematical has an interesting article about Ride Lonesome, that might pique your desire to see this film. Sounds interesting. I own two Boetticher movies; The Man from the Alamo with Glenn Ford, and Two Mules for Sister Sara with Clint Eastwood and Shirley MacLaine. This set goes on my wish list. If you like those two films, although I don't consider Two Mules a true Boetticher film, you'll love this set. I would also recommend getting Seven Men from Now, just for Lee Marvin's scene stealing performance.. Right! It's now on my wish list. Lee Marvin was almost always great. I'm still trying to get through M Squad, though. Not that it's bad, but it is 48 hours in total. I really liked the DVD of Seven Men From Now. It looks great and, of course, Lee Marvin is one of the great western bad guys (reaching the pinnacle of western evil in "The Man Who Shot Liberty Valance"). Lee Marvin was good in Cat Ballou as well. Hey Rog, did you ever get around to watching this set?